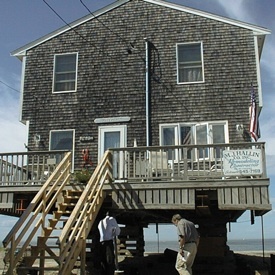 Elevating existing structures is one way to protect them from flooding and help prepare for projected sea level rise. For buildings in hazardous areas that cannot be relocated or removed, the best option may be to retrofit them to improve their chances of surviving storm events. FEMA and other organizations have done extensive research to determine what type of construction techniques best survive storms. Retrofitting options to improve a building’s storm readiness include elevating it on open pilings above predicted flood heights, incorporating freeboard into design, anchoring structures to resist flotation, reducing or completely removing impervious ground cover, and installing protective structures over windows and doors. While not all of these options are inexpensive, there is potential funding available. The Federal Emergency Management Agency’s (FEMA) Coastal Construction Manual is perhaps the most important and expansive source on building in the coastal zone. While it is primarily written for building professionals (contractors, architects, building inspectors), it includes information for the general audience as well. See, in particular Section 14.5 Retrofitting Opportunities, and Section 14.6 Retrofitting Costs. To obtain a free copy of the Coastal Construction Manual (in print or on a CD), contact the FEMA Publications Distribution Facility at (800) 480-2520. FEMA’s Home Builder’s Guide to Coastal Construction includes 31 fact sheets. Page 6 of fact sheet 30, Repairs, Remodeling, Additions, and Retrofitting, outlines retrofitting options for homes in coastal areas. Hurricane Katrina in the Gulf Coast: Mitigation Assessment Team Report, Building Performance Observations, Recommendations, and Technical Guidance is an extensive report published by FEMA on what types of structures survived best during the 2005 hurricane season. FEMA’s Recommended Residential Construction for the Gulf Coast: Building on Strong and Safe Foundations provides additional best practice techniques on how to design, build, and rebuild in coastal areas. FEMA’s Mitigation Assessment Team Report: Summary Report on Building Performance 2004 Hurricane Season summarizes the observations, conclusions, and recommendations that were obtained during FEMA’s post-disaster assessments in 2004. The Florida Division of Emergency Management’s Hurricane Retrofit Guide describes how homeowners can protect their homes from wind and rain damage.